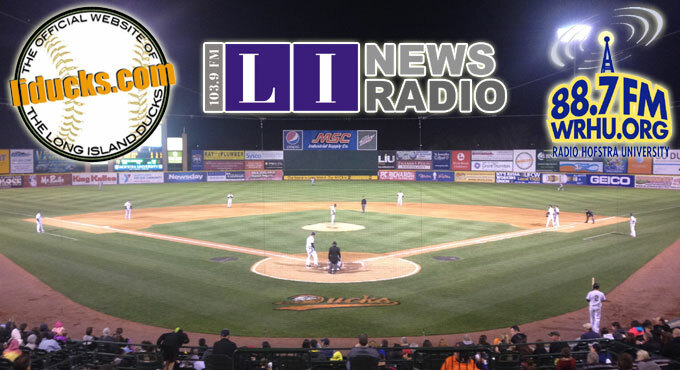 (Central Islip, N.Y., Feb. 26, 2015) – The three-time Atlantic League champion Long Island Ducks today announced a new radio agreement, designating WRCN/103.9-FM LI News Radio as the team’s flagship radio station for the 2015 and 2016 seasons. All Friday and Saturday night games, as well as a special “Ducks Game of the Week,” will be aired on 103.9-FM and online at www.LINewsRadio.com for the duration of the agreement. In addition, all Wednesday and Sunday home games will also be broadcast live on WRHU/88.7-FM Radio Hofstra University, for fans in Nassau County. (The full 2015 Radio Network Broadcast Schedule can be found below). A total of 87 games will be broadcast on the Long Island Ducks Radio Network during the 2015 season, including 65 on LI News Radio and 22 on WRHU. In addition to airing all Friday and Saturday games (home and away), 103.9-FM will now carry a special “Ducks Game of the Week” featuring all eight clubs in the Atlantic League, along with a mixture of Monday through Thursday games. Included in this special slate is the Atlantic League All-Star Game, which will be played on Wednesday, July 8 at The Ballpark at Harbor Yard in Bridgeport, Conn. In addition to game broadcasts, LI News Radio will be offering Ducks fans extensive coverage of the team throughout the year. Weekly updates will be featured with Jay Oliver in the morning and John Gomez in the afternoon. Updates will include live interviews with Ducks players, coaches and team personnel. The Ducks will offer broadcasts of all 140 regular season games on the team’s official website, www.liducks.com. Every home game at Bethpage Ballpark will include a live video and audio stream via the Ducks Official YouTube Channel. All road games that are not aired on 103.9-FM will feature live streaming audio on the team’s YouTube channel. Each game will be preceded by the North Shore LIJ/Southside Hospital pre-game show, beginning 15 minutes prior to first pitch. The radio broadcast team includes popular Long Island radio personalities Chris King and David Weiss, who have been involved with the team since the inaugural 2000 season. Ducks Director of Media Relations and Broadcasting Michael Polak, who begins his sixth season behind the mic with the Flock, and Chris Buckley, who enters his first year as the team’s Media Relations and Broadcasting Assistant, will also be featured on air throughout the season. Polak was on the call for the Ducks back-to-back Atlantic League championship victories in 2012 and 2013, while Buckley has previously broadcast baseball and other intercollegiate athletics for Hofstra University. * Saturday, April 25 at York – 6:30 p.m.
* Tuesday, April 28 at Southern Maryland – 7:05 p.m.
* Saturday, May 2 vs. Sugar Land – 6:35 p.m.
* Wednesday, May 6 at Bridgeport – 7:05 p.m.
* Friday, May 8 vs. Lancaster – 6:35 p.m.
* Saturday, May 9 vs. Lancaster – 6:35 p.m.
* Thursday, May 14 vs. Bridgeport – 6:35 p.m.
* Friday, May 15 at Lancaster – 7:00 p.m.
* Saturday, May 16 at Lancaster – 7:00 p.m.
* Monday, May 18 at Lancaster – 7:00 p.m.
* Friday, May 22 vs. Camden – 6:35 p.m.
* Saturday, May 23 vs. Camden – 6:35 p.m.
* Wednesday, May 27 at Somerset – 7:05 p.m.
* Friday, May 29 at Somerset – 7:05 p.m.
* Saturday, May 30 at Somerset – 7:05 p.m.
* Tuesday, June 2 vs. York – 6:35 p.m.
* Friday, May 5 at Camden – 7:05 p.m.
* Saturday, May 6 at Camden – 5:35 p.m.
* Monday, June 8 vs. Southern Maryland – 6:35 p.m.
* Friday, June 12 at Bridgeport – 7:05 p.m.
* Saturday, June 13 at Bridgeport – 6:05 p.m.
* Thursday, June 18 vs. Sugar Land – 6:35 p.m.
* Friday, June 19 vs. Bridgeport – 6:35 p.m.
* Saturday, June 20 vs. Bridgeport – 6:35 p.m.
* Thursday, June 25 at Sugar Land – 8:05 p.m.
* Friday, June 26 at Sugar Land – 8:05 p.m.
* Saturday, June 27 at Sugar Land – 7:05 p.m.
* Tuesday, June 30 vs. Lancaster – 6:35 p.m.
* Friday, July 3 vs. Somerset – 6:35 p.m.
* Saturday, July 4 vs. Somerset – 6:35 p.m.
* Wednesday, July 8 – Atlantic League All-Star Game at Bridgeport – 7:05 p.m.
* Friday, July 10 at Somerset – 7:05 p.m.
* Saturday, July 11 at Somerset – 7:05 p.m.
* Thursday, July 16 at Lancaster – 7:00 p.m.
* Friday, July 17 vs. Somerset – 6:35 p.m.
* Saturday, July 18 vs. Somerset – 6:35 p.m.
* Tuesday, July 21 vs. York – 6:35 p.m.
* Friday, July 24 at Bridgeport – 7:05 p.m.
* Saturday, July 25 at Bridgeport – 6:05 p.m.
* Thursday, July 30 vs. Somerset – 6:35 p.m.
* Friday, July 31 vs. Bridgeport – 6:35 p.m.
* Saturday, August 1 vs. Bridgeport – 6:35 p.m.
* Friday, August 7 at Sugar Land – 8:05 p.m.
* Saturday, August 8 at Sugar Land – 7:05 p.m.
* Tuesday, August 11 vs. Camden – 6:35 p.m.
* Friday, August 14 vs. Southern Maryland – 6:35 p.m.
* Saturday, August 15 vs. Southern Maryland – 6:35 p.m.
* Wednesday, August 19 at Somerset – 7:05 p.m.
* Friday, August 21 vs. Camden – 6:35 p.m.
* Saturday, August 22 vs. Camden – 6:35 p.m.
* Thursday, August 27 at Southern Maryland – 7:05 p.m.
* Friday, August 28 at Southern Maryland – 7:05 p.m.
* Saturday, August 29 at Southern Maryland – 6:35 p.m.
* Thursday, September 3 vs. Bridgeport – 6:35 p.m.
* Friday, September 4 vs. Southern Maryland – 6:35 p.m.
* Saturday, September 5 vs. Southern Maryland – 6:35 p.m.
* Friday, September 11 vs. Sugar Land – 6:35 p.m.
* Saturday, September 12 vs. Sugar Land – 6:35 p.m.
* Tuesday, September 15 at York – 6:30 p.m.
* Friday, September 18 at Lancaster – 7:00 p.m.
* Saturday, September 19 at Lancaster – 7:00 p.m.
* Sunday, May 3 vs. Sugar Land – 1:35 p.m.
* Sunday, May 10 vs. Lancaster – 1:35 p.m.
* Wednesday, May 13 vs. Bridgeport – 6:35 p.m.
* Sunday, May 24 vs. Camden – 1:35 p.m.
* Sunday, May 31 vs. York – 1:35 p.m.
* Sunday, June 7 vs. Southern Maryland – 1:35 p.m.
* Wednesday, June 10 vs. Southern Maryland – 6:35 p.m.
* Wednesday, June 17 vs. Sugar Land – 6:35 p.m.
* Sunday, June 21 vs. Bridgeport – 1:35 p.m.
* Wednesday, July 1 vs. Lancaster – 6:35 p.m.
* Sunday, July 5 vs. Somerset – 5:05 p.m.
* Sunday, July 19 vs. Somerset – 5:05 p.m.
* Wednesday, July 22 vs. York – 6:35 p.m.
* Wednesday, July 29 vs. Somerset – 6:35 p.m.
* Sunday, August 2 vs. Bridgeport – 5:05 p.m.
* Sunday, August 9 vs. Camden – 5:05 p.m.
* Wednesday, August 12 vs. Camden – 6:35 p.m.
* Sunday, August 16 vs. Southern Maryland – 5:05 p.m.
* Sunday, August 23 vs. Camden – 5:05 p.m.
* Wednesday, September 2 vs. Bridgeport – 6:35 p.m.
* Sunday, September 6 vs. Southern Maryland – 1:35 p.m.
* Sunday, September 13 vs. Sugar Land – 1:35 p.m.